So this post is dedicated to food lovers(like myself) ,as I said in this post that I would start a food adventure and I think I am beginning to love it. A friend of mine had a birthday dinner at Cafe Chrysalis some days ago and she decided the restaurant we would all go to. Although I’ve been been there before with a couple of friends. 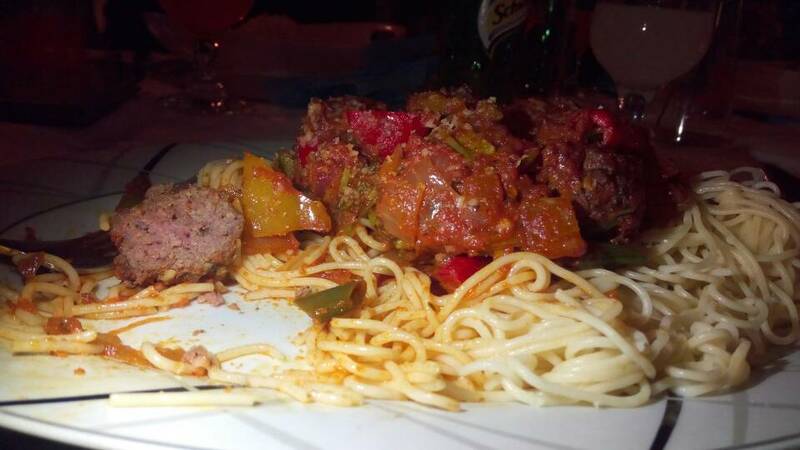 My main dish was meat balls with tomato sauce and pasta as a side and I am so glad they did justice to the meal. The sauce was properly sautéed and the meat balls were properly made. The only thing I do not like about this place is their lightning. I could not get great pictures as the lightning is actually terrible, I had to use a flashlight to be able to take good pictures. It also took forever for the light to come back on after the power cut as we practically had to bring that to their attention (rolls eyes). I wish I took pictures of everyone’s main dish, the lightning was a major turn off so I was not encouraged. Cafe Chrysalis is located at 23 Ilaro street, off Alabiyamo street, Old Bodija, Ibadan. There is also another branch at Ringroad, Ibadan. Ever been to Cafe Chrysalis? What was your experience; was it a great one or otherwise? If you’ve not, would you? My outfit detail is on my Instagram page. Do not forget to follow me on Instagram , Twitter and Facebook if you have not. Also, don’t forget to like and share this post. Great post! Yeah, I have been there a few times. I totally agree with you regarding the lightning although I’d also say it kinda adds to the cozy feel of the restaurant. The thing I dislike most about Cafe Chrysalis though, is their preparation time. The last time I went there with a few people amongst which was my sister, we waited at least 2 hours before the food came along which was only hastened because my sister developed ulcer pain. I resolved never to go there when I need to quench hunger. A lot has changed in Ibadan o. Really wish I had so much time there to explore. Ilorin is as boring as it gets. I’m sure there are great places in Ilorin too. I agree with the lightning problem. Even with the ever smiling waitress, they still wasted time. Sigh!. But as a huge lover of jazzzz, waiting wasn’t a problem cause you know, jukebox?. Food was really amazing too. You should try their porridge (have it with fish instead). Amazing post, Tife! I love pasta and tomato sauce too with sliced carrots, green pepper, spring onions etc. Read good knowledgeable topics, visit my blog, if you like my blog hit like button and don’t forget to press follow also share your valuable comments and feedbacks.